Next stop: Byron Bay. We visited the Arts Factory, stopping for a coffee and, later in the day, for some beer tasting (they have their own brewery). Byron Bay has a lovely sandy beach with an inviting wavy blue sea. The sea, however, was misleading – in fact there was an immensely strong current running along the beach – so strong that it was like wading through a strong river. Any time you lost your footing or tried swimming, you were very quickly 10m down the shore from where you’d just been. We had some fun jumping in the waves though and then trekked back up the beach to top up our tans. As the sun began to sink behind the hills, we headed up to the nearby lighthouse for sunset. This is very nearly the most easterly point of Australia; it’s a little walk to the actual spot, but we figured we’d got close enough. As you can see, we enjoyed a sunset over hills and sea with lighthouse in the background. It was lovely to be met by familiar faces at Perth airport – Tia & Ali, friends who’ve recently moved out there, picked us up and then looked after us for a whole week! It was great to hang out with them and go exploring a little. On the evening of our arrival we had our first home-cooked meal in months – a lovely roast chicken – very much enjoyed! The things to do in the south west seem to be going to beaches, drinking alcohol and looking at trees. We did a good amount of each, starting with a day around the Swan Valley tasting wine. Tia kindly volunteered to drive and the rest of us tasted about 22 wines over the course of a few hours interspersed with samples of cheese, olives and even honey (they had 4 different flavours of natural honey!). The next day we went into town, bought the Lonely Planet (which is a third more expensive here than in the UK, despite being an Australian company) and then headed to the beautiful, windy and wavy Scarborough beach for a swim and a slight sandblasting. The 4 of us then set off on a 3-day road trip to see some of the sights of Australia’s South West. We travelled via Australind to Margaret River (where we sampled some more wine) and then on to Augusta where the Indian & Southern Ocean’s meet and which is Australia’s most South-Westerly point. It also has a locally-famous Chinese restaurant which turned out to be rather average. The next day was all about BIG trees. We climbed a 68m karri tree using metal spikes that had been driven into it and some ladders near the top. Great view! (I say that ‘we’ did it, when in reality Lizzy decided not to continue at the 25m rest point… I overcame my fear of heights and pressed on up to the top!). Next stop was the Giant Tingle Tree and then on to Walpole for the night. Our travels back to Perth included a stop at Mandalay Beach, where every 10 years a ship-wreck seems to appear from the sea at very low tide (we weren’t there at the right time it seems), a pause for a chance encounter with a woman who rescues orphaned kangaroos (we got to stroke them and watch them feed), a brief visit to a cidery which made some OK cider and finally at a weird place that I can’t recall the name of. It’s a tiny place with just a general store, some farm buildings and accommodation and a rather large population of semi-wild kangaroos, emus and parrots! You can buy feed from the store and then become like the Pied Piper as all the animals pursue you to get to the food. It sounds cute and friendly, but the emus are pure evil and the kangaroos aren’t much better (OK, slight exaggeration, but I was freaked out by the emus). The emus will peck hard at anything that looks like food – the feed, the bag, your hand, your feet (where someone might just have “accidentally” thrown some food – thanks Ali!) and stare at you with unblinking orange eyes when they’re not busy pecking. For Australia Day, we headed down to Freemantle (or “Freo”) and learned about some Australian shipwrecks and innovative Australian beer-brewing at Little Creatures. A taste of local fish & chips, a swim in the sea and it was time to head back to Perth to join the celebrations. Australia Day is a national holiday and a chance for everyone here to be proud of being Ozzie (even if you’re not!). We joined tens of thousands in Kings Park (which was just one view point) to watch ‘Skyworks’ – a huge fireworks show with sound track played over the local radio. Wow! A packed and lovely week – thanks Tia & Ali & everyone who made it so fun for us! From Medan, we ventured further north into the province of Aceh, via the 10 hour quite-comfortable-but-nowhere-near-as-good-as-a-bed night bus. Aceh and its main town Banda Aceh became famous when somewhere in the region of 150,000 people died in 3 minutes when the tsunami hit a few years back. As you stand in the low-lying city, it’s hard to imagine a wave washing over it, but at the same time easy to understand how it was so vulnerable – it is very flat and only just above sea level. Thanks to all the foreign aid, much of the city has been rebuilt and it feels like one of the nicer cities we’ve gone to – at least in terms of quality of roads, buildings etc. We passed through Banda Aceh on our way to catch the ferry to the island of Pulau Weh which is a speedy 45-minute boat trip off the northern coast of Sumatra. The attraction for us, once more, was the beaches and the diving – and both lived up to expectations – the worst thing about the place was that we couldn’t stay more than 2 nights! The rest of the time we spent relaxing on the beach and waiting for food to arrive – the restaurants on the beach were really slow and quite often confused. 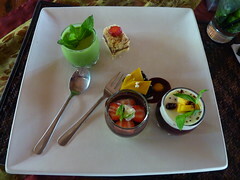 One morning we ordered a pancake, a fruit salad and a coffee. What we got was 2 fruit salads, 2 coffees and a pancake (although I think the pancake they thought was for someone else)… then later they brought out 2 more fruit salads! I don’t think anyone had a clue what was going on. Having said that, the food we had here, when it eventually turned up, was some of the best we’d had in Indonesia. Unfortunately, no sooner had we settled in than we had to pack our bags and start the big trek to Perth, via a carefully-coordinated series of taxis, becaks, night buses, flights and a quick stop-over in a hotel in Singapore… We have 20 hours to explore Singapore, so we’d best get going! After a memorable visit to Salatiga, we decided to continue the reminiscing and head to Kopeng, where Lizzy had been on holiday with her family when she lived in Java. It was just a short local bus journey up into the mountains and we found ourselves there before lunchtime and looking for accommodation. We’d expected it to be a bit more foreign-tourist-friendly, but we got strange looks as we walked through town examining the different hotels on offer. After visiting a few less-than-desirable options, I finally discovered a nice little place down a little track and we booked in for the night. We had 2 things on the agenda for Kopeng – firstly to find the “Shangri La” guesthouse where Lizzy had stayed with her family 20+ years ago, and secondly to find our way the next morning to Ketep Pass for views of Gunung Merapi and Merbabu. Finding Shangri La was relatively easy (the locals fortunately understood the name of the place combined with our basic Bahasa Indonesia for ‘where is:’ “Di mana Shangri La?”). Unfortunately though, it seemed to have closed a long time ago – the gates were padlocked and the gardens overgrown. We could only catch glimpses of the house itself through the gate and gaps in the fence as we looked around. Nice to find the place, but a shame that was where it ended – it was always going to be a let-down after our incredible success in Salatiga! Our second mission proved somewhat harder. After having asked the only english-speaking person in the town (who promptly drove off with his small french tour group) about getting to Ketep Pass, he suggested we get a car to take us for $50 (!) or hire a motorbike and drive there ourselves for about $10. Neither seemed appealing – the former was way too expensive for a 40km round-trip and the latter seemed a little too ambitious considering the distance and state of the roads. However, we looked into both options and couldn’t progress either of them given the language barrier. We decided we’d just get up early the next morning and see if we could figure out a way there… and we were glad we did! Getting up before 6am, we meandered out of our room with no idea how we’d get to the pass. Fortunately one of the owners was up already and told us we could get a public bus and then hire a motorbike nearer the pass. After 20 minutes waiting for such a bus, we were embarassed that the owner was still waiting with us on the road and he seemed to sense this and stopped a passing bemo (tiny minivan-come-bus) which we chartered for a few hours. After dropping his whole family at the market with their goods to sell for the day, we headed up to the pass. When we arrived at the pass, the surrounding landscape was shrouded in cloud and we thought perhaps the trip hadn’t been quite worth it (another few hours’ sleep wouldn’t have gone amiss!). The whole place – museum, restaurant, terraces etc – was deserted and we figured everyone else knew better than us! However, as we stood there, the clouds cleared and we got amazing views over the valleys and across to Gunung Merapi (Indonesia’s most active volcano) which was spewing brown smoke and also to Merbabu. Well worth the early start and expense in the end! The Gili Isles Part 1: Tropical Paradise! 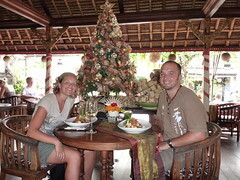 Our Boxing Day arrival on Gili Trawangan was a slight shock to the system – mostly in a good way! After cities full of cars, trucks and motorbikes, here the only forms of land transport are bikes and horse & carts! Also after a lifetime of freshwater showers, here the only ones available (in our budget) are salt-water! Seeing dolphins en route here was a treat, although we have very little photo evidence of this encounter as they don’t stay still at all and move incredibly fast. We’ve seen lots of other wildlife here – although mainly under the water doing our advanced SCUBA diving course. We have seen lots of turtles (including one massive one – about 1.5m long), some white-tip reef sharks (well, Alex did, Lizzy managed to miss them! ), octopuses, cuttlefish, clown fish (aka Nemo) and loads of other fish & coral. Despite diving at “Manta Point”, we haven’t yet seen manta rays, just their younger cousins sting rays. Visibility is amazing – mostly 20-30m and the water is 28-30 degrees – WOW! We’ve done 4 dives so far and have another 2 planned, including a deep Nitrox dive, on which Lizzy hopes to see the sharks this time. We’re staying another 4 nights here, until after New Year… although it is tempting to live out here for a few years and work as dive instructors (After doing our rescue & dive master qualificatioons – about 8 weeks’ training and about $750 – not bad for all the dives you can handle and learning a new profession in the mean time!). So if we’re not heard of again, this is probably the best place to look. Internet (and electricity) isn’t great here though, so can’t upload photos… will endeavour to do that somewhere in Java. After a Christmas morning lie-in and some carols sung in bed (!) 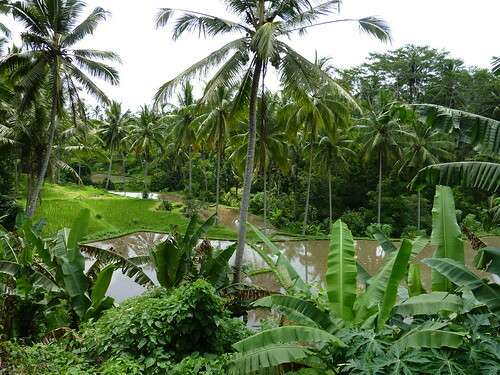 to get us in the Christmas spirit, we went out to explore around Ubud. We hired a motorbike (sorry parentals – we know we promised we wouldn’t do that again, but it’s very cheap and the roads aren’t too crazy here!) and buzzed off to see the nearby sights. 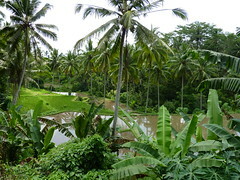 The countryside here is much more lush than anywhere else we’ve been so far, mainly because it’s Bali’s wet season, so everything is growing – including rice paddy after rice paddy! 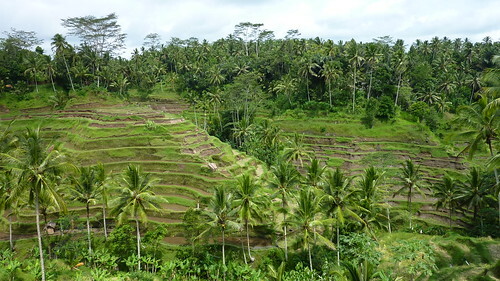 Rice paddies and terraces do make for beautiful scenery, especially when filled with beautiful bright green rice shoots. Then it was time for lunch! The day before, we had spotted a restaurant offering Christmas dinner, so we sought this out and gave it a go. We had the traditional turkey, gravy, stuffing, potatoes, cranberry sauce, but all with a unique twist and accompanied by some new bits like sharon fruit and purple potatoes (we think!). For dessert, we just couldn’t choose, so we had one of everything on the menu – each! 5 puddings later (green tea ice crean, apple & cinamon crumble, chocolate cake, chocolate mousse and black sticky rice pudding *) and we were ready to roll back to our hotel for a nap. In the evening, we decided we would pamper ourselves with a Royal Javanese Massage – a wonderufl 2-hour indulgence! We had a long oil massage, followed by a salt body scrub which was left to dry out on our skin. Once this had been brushed off, we had another new experience – being covered head to toe in yoghurt! (We assume this was to rehydrate our skin after the salt). Finally we showered off and stepped into a warm bath with a complete layer of fresh flowers floating on the top. We came out feeling very lovely indeed.